Ignition Seating From Hon Fits Your Body, Your Work And Your Space. This Cafe-Height Stool Brings You Closer To Work At 36"H Or Sit-To-Stand Worksurfaces, While Also Delivering Greater Support And Comfort. The Choice Of Breathable Ilira-Stretch Mesh Or Upholstered Back Cradles Your Spine In Ergonomic Support, And The Contoured Fabric Seat Hugs The Natural Curves Of Your Body For All-Day Comfort. The Wall-Saver Leg Design Prevents Damage To Nearby Walls And Furniture, And Nylon Glides Make It Easy To Move The Stool Around Your Environment. Set A Higher Bar For Performance With The Hon Ignition Cafe Height Stool. Ilira-Stretch Mesh Back And Frame Color Are Black. Seat Color Is Navy..
Ignition Seating From Hon Fits Your Body, Your Work And Your Space. This Cafe-Height Stool Brings You Closer To Work At 36"H Or Sit-To-Stand Worksurfaces, While Also Delivering Greater Support And Comfort. The Choice Of Breathable Ilira-Stretch Mesh Or Upholstered Back Cradles Your Spine In Ergonomic Support, And The Contoured Fabric Seat Hugs The Natural Curves Of Your Body For All-Day Comfort. The Wall-Saver Leg Design Prevents Damage To Nearby Walls And Furniture, And Nylon Glides Make It Easy To Move The Stool Around Your Environment. 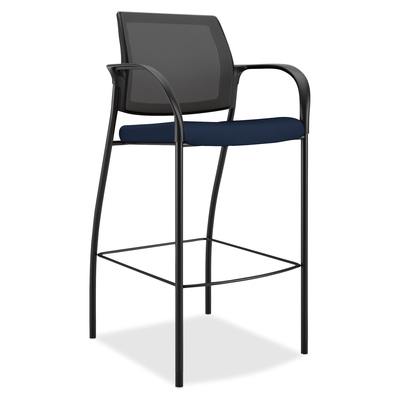 Set A Higher Bar For Performance With The Hon Ignition Cafe Height Stool. Ilira-Stretch Mesh Back And Frame Color Are Black; Seat Color Is Navy.